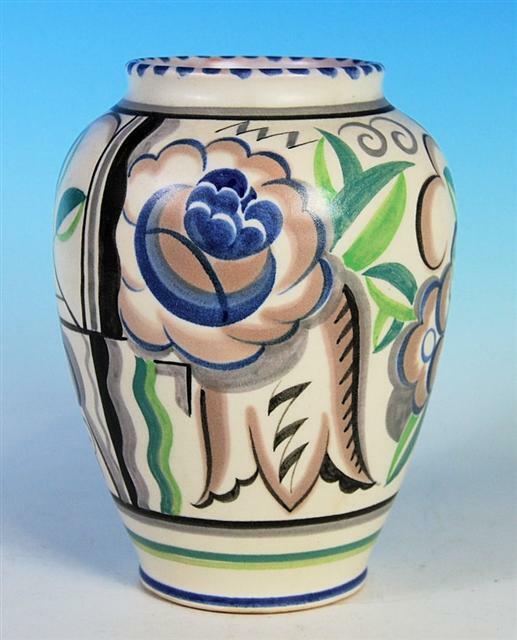 Poole Pottery is probably best known for the colourful hand painted floral designs created by Truda Carter after her arrival at the Pottery in 1921. Drawing on many contemporary influences, these were painted on to hand thrown pots in standard shapes and sizes made from the deep red clay found locally. The clay pots were slipped with a white clay on the outside and the decoration was painted on to a clear glaze. The reaction between the glaze and the colours in the kiln gave the pots a unique depth and warmth of colour. Pots produced by this method became known as ‘traditional’ within the Company to distinguish them from the later ranges such as studio, Delphis, contemporary and free form which were produced alongside the 'traditional' range as the Pottery moved with the times. Pottery in the traditional style was produced at Poole in one form or another from the 1920's until 2017. There are a number of ways to date traditional pieces. Certain artists worked for limited periods only and their mark can enable accurate dating. A list of known marks can be found in Hayward and Atterbury. It is relatively easy to date a piece to before or after 1934. At this time the Pottery changed from a traditional red clay to white earthenware body because the Carter and Co pits were becoming depleted. From 1934-1937 the white body of the piece was covered by a pink slip. However, the white base can be seen where any incised or impressed mark cuts through the slip. After 1937 there is no pink slip and the base is all white. There was little production of decorative wares between 1939 and 1945 and traditional patterns with a white base and the impressed Poole mark date from just prior to, or just after the War. Any decorative pieces made between 1945 and 1952 would have been for the export market only (see below). Above left - white earthenware of the vase showing through the pink slip where the pattern number has been incised. Painted by Eileen Prangnell, 1934-1937. Above right - original red clay vase by Ruth Pavely, pre 1934. Ruth Pavely went on to become Head of Painting and is regarded as one of the best paintresses of her time. In 1925 Carter Stabler and Adams were represented at the International Exhibition of Modern Decorative and Industrial Art in Paris. The French styles and designs on display proved to be extremely influential and were taken up by many of the contemporary potteries. Initially known as 'Jazz Modern' , the style has now become known as Art Deco. Designs which include clouds, geometric shapes and leaping deer - and vases with stepped handles - are all characteristic of this era. Above left - pattern GB shape 856 by Marjorie Batt. Right - pattern BS shape 966 by Anne Hatchard. Above - pattern AX is typical of the Art Deco geometric designs of the 1920's and 1930's. The vase shape 966 by Mary Brown, 1926-1934 on red clay. Shape 966 is regarded by some as the most attractive of the traditional vase shapes as it shows many of the patterns off to their best advantage. The factory experimented with different colour variations and combinations of many patterns. Pattern GAX (above left) is a version of pattern AX in green and pattern CT (above right) is a variation in green and blue. Both vases are painted by Ruth Pavely on red clay. Further variants are shown below. Pattern NM shape 966 (above left) is a version of pattern AX in purple and yellow. The central vase is pattern BT, a subtle variant of AX. The twin handled vase (shape 201) is by Margaret Holder. All of the vases date from 1927-1934. There is no pattern code on the twin handled vase. 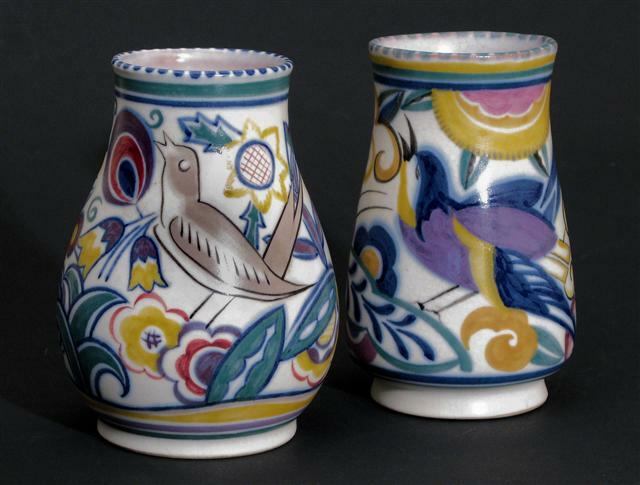 Above - A pair of vases in pattern BC (sometimes called the scimitar pattern) shape 333, painted by Eileen Prangnell on a pink slip over white earthenware. The pair of vases is pictured with vase shape 201 pattern AX by Ruth Pavely. Above - shape 201 was also made as a ginger jar with a lid. Left - Pattern AX by Ruth Pavely. Right pattern PR(G) by Marian Heath, 1925-1938. Above - pattern BL, a variation of the scimitar (BC) pattern. Above - pattern DJ in different colour variations by Marian Heath and Margaret Holder. Above - pattern MM by Mary Brown 1926-1934. 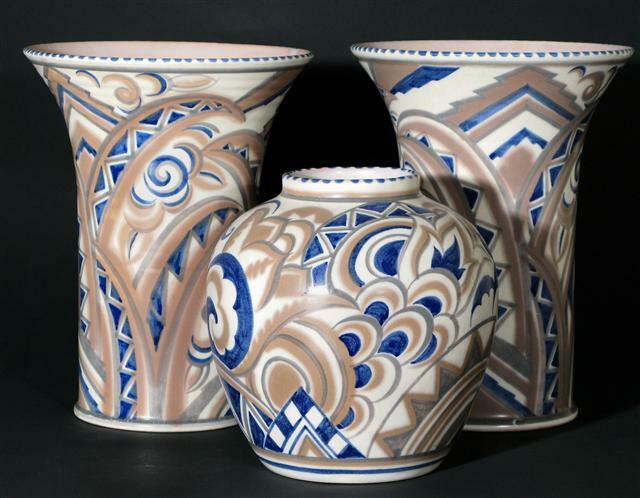 Above - vases with fluted sides in different colour variations. From left to right, patterns VZ, GM and CA by Anne Hatchard. The right hand vase has no pattern or paintresses mark. All are on red clay. 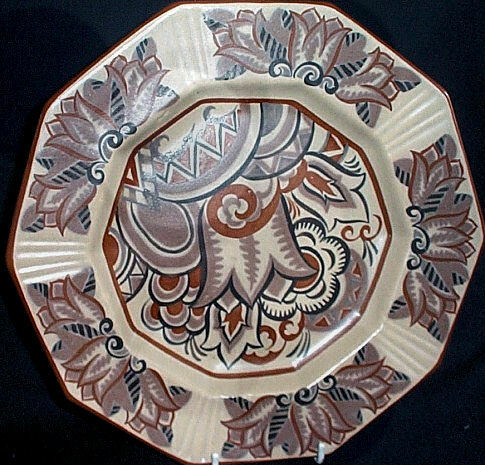 Above - pattern DH plate on red clay by Mary Brown (1926-1934). Patterns E and F are spectacular examples of geometric patterns which work well on large pieces. Pattern E is blue and pattern F is green. The green vase does not have a pattern code. Pattern E is rare but does also exist on shape 966. A more common variation is in yellow (pattern YE, meaning yellow variant of pattern E). Where a pattern has a dominant colour, the first letter of the colour sometimes appears as a prefix to the pattern design - examples here are AX and GAX above and EP and GEP below. Both of the vases above are shape 916, on red clay and painted by Ruth Pavely. One of the more striking geometric patterns is KN. The combination of blue and yellow and bold lightning strikes are particularly appealing. Patterns LW (left) and KN (centre) are an interpretation of a design by Mme Charlotte Raisin which appears in a contemporary French pattern book (right). Another good example of identical patterns in different colours is EP and its green counterpart GEP. Pattern EP to the right is painted by Anne Hatchard on red clay and pattern GEP to the left is painted by Marian Heath on white earthenware with a pink slip. Both are shape 966.The green version is probably the scarcer. Above - Vases in shape 973 showing different colour variations of the same pattern. Left OD by Anne Hatchard. Right OL by Mary Brown. Above left - pattern VY by Eileen Prangnell. Right - pattern the green variant of the same pattern by Marian Heath. Pattern BX by Eileen Prangnell (left) and CY an unusual yellow variant of the same pattern by Ruth Pavely. Above - patterns GPA (Eileen Prangnell) and PA (Margaret Atkins). Above left - a blue variant of pattern PA (no pattern code) by Eileen Prangnell. Right - unsigned plate shape 495 and marked 1757G (probably a glazing trial mark). Above - pattern CO by Mary Brown (left) and pattern CU by Ruth Pavely (right). Above - pattern PU by Ruth Pavely (left) and Eileen Prangnell (centre)with a variant in brown. 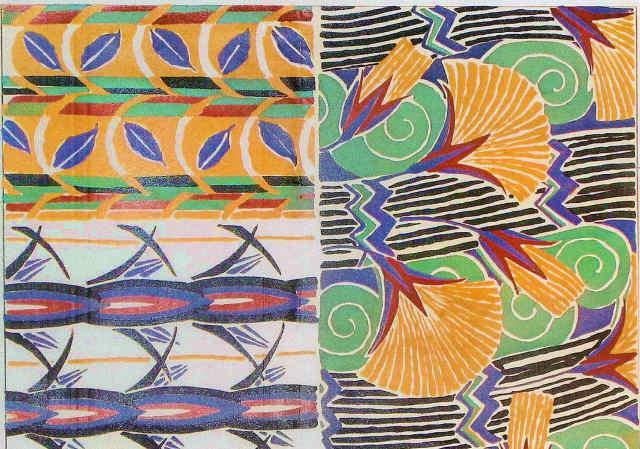 Above - variations of pattern BR by Anne Hatchard and (right) Ruth Pavely. The pattern usually has a sprayed green glaze but the right hand vase is a more unusual variant. Above - a large and spectacular vase in an unusual combination of yellow, green and blue. Shape 900, pattern GL by Anne Hatchard. Above - patterns with a black background are particularly sought after by collectors. Pattern HX (vase above and charger below) are painted by Anne Hatchard. 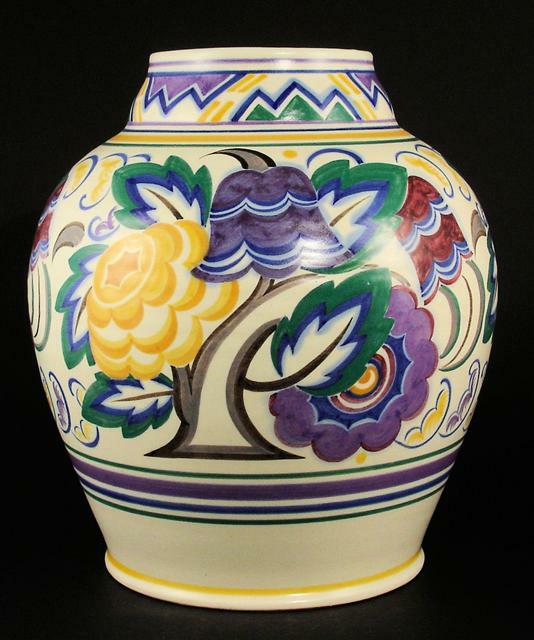 A similar vase from the Poole Pottery Museum was included in the Christies Museum sale in 2004. Pieces in this pattern rarely come to the market. Another rare pattern is AW (below). The shape is 916 on red clay and the paintress is Ruth Pavely. The same design does exist in another colour variation. This design has more than a passing resemblance to a French curtain and wallpaper design from the 1920's. Above left - plate from Seguy's 'Suggestions pour etoffes et tapis. 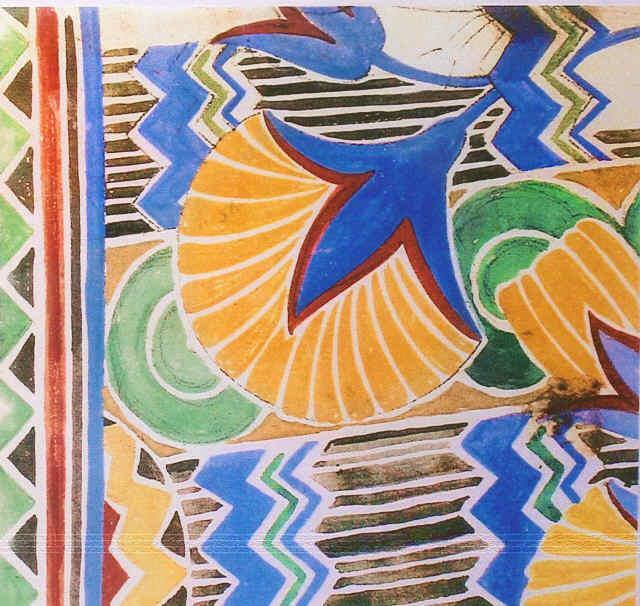 60 motifs en couleur' 1927/8. Above right -Truda Carter design from a pattern book belonging to the former Poole Pottery archives. Pattern XD on shape 966 in an unusual pattern painted by Ruth Pavely. On white earthenware with a pink slip, 1934-1937. Above - pattern TX shape 962 on red clay by Anne Hatchard. Above - pattern TV. 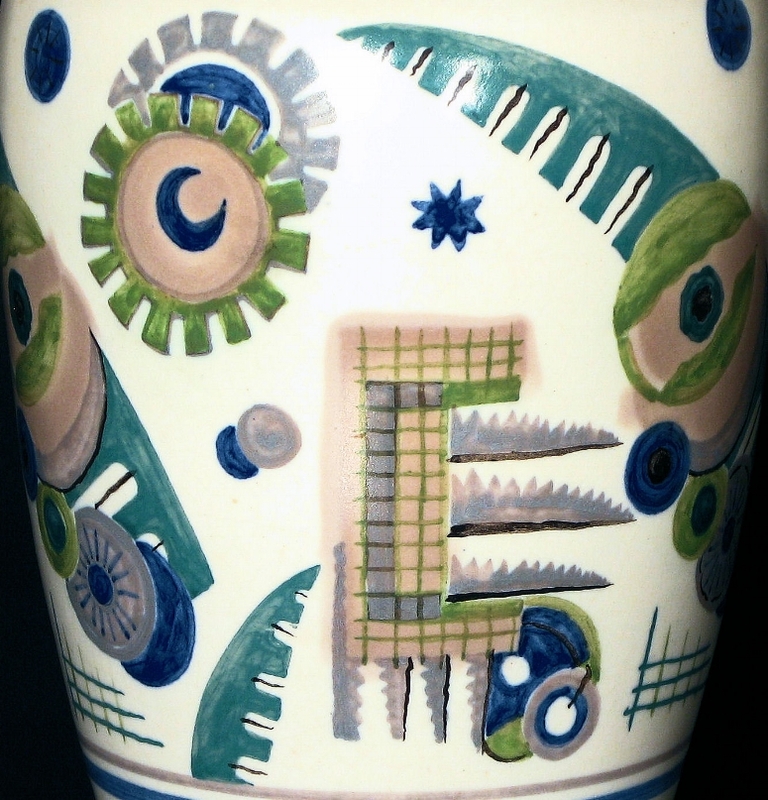 The left hand vase painted by Margaret Holder, the right hand vase shape 966 with no markings. Above shape 514 pattern UB by Eileen Prangnell. Above - Shallow dish shape 909, approx diameter 11 inches, no paintress mark. Above - Pattern LJ shape 947 painted by Anne Hatchard. Above left pattern GPR by Eileen Prangnell. Centre pattern ZI. Pattern LH shape 970 by Eileen Prangnell. The splashed glaze design is shown on a factory pattern sheet which is reproduced in Hayward & Atterbury at Page 70. The retail price in the early 1930's was 1 guinea. Although a relatively common pattern, groups of pieces and large vases can look spectacular. The 12 inch vase above is shape 947 pattern HE by Marian Heath. 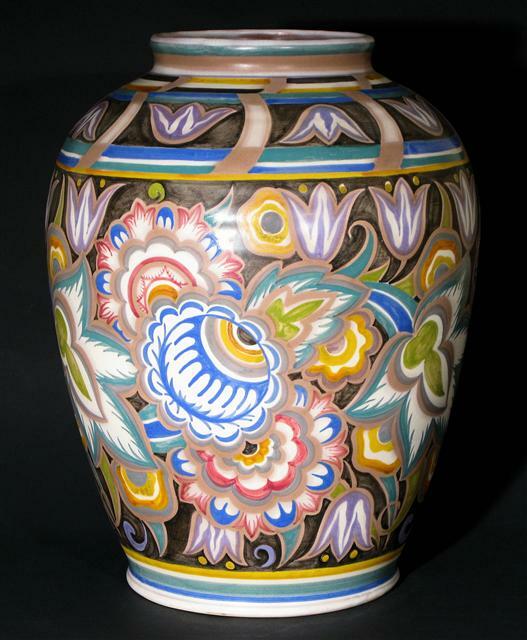 The white earthenware base and pink slip date the vase between 1934 and 1937. Above - comic bluebird (pattern SZ). Left - pattern AS on shape 266 by Clarice Heath on a white earthenware base with pink slip. Right - shape 204 pattern SN on red clay by Marjorie Batt. 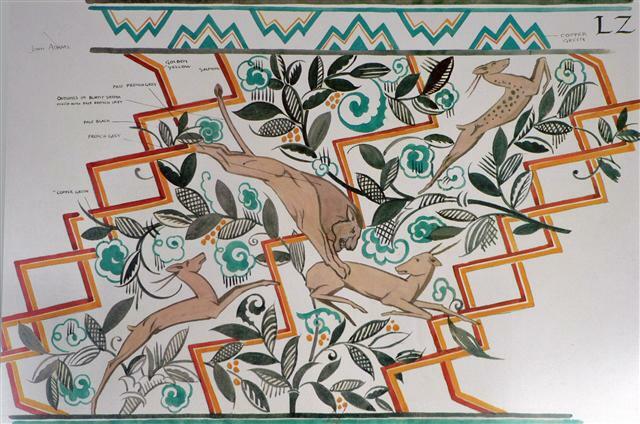 Below - John Adam's 'leaping gazelle' design is another iconic image both of Poole Pottery and the art deco period. Although born in Staffordshire, John Adams had previously been head of the School of Art at Durban Technical College. Above - moulded dish shape 211 pattern FW by Anne Hatchard. Variants of the leaping gazelle design; left pattern EZ shape 916 by Anne Hatchard, centre pattern GA by Anne Hatchard, right pattern EZ shape 846 (13 inches), Ruth Pavely c1937. 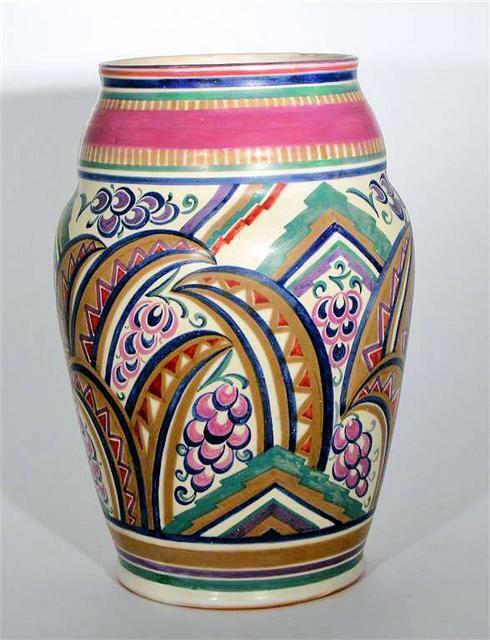 Above - twin handled vase shape 973 pattern ON, painted by Anne Hatchard. Above - 'Persian Deer' pattern. Above - An extract from the CSA factory pattern book showing John Adams' original LZ Bush-Velt design. Above - Bush-Velt vase on red clay shape 946 pattern LZ standing almost 16" high. Painted by Ruth Pavely. Designed by Olive Bourne, the Leipzig Girl (above) takes her name from the International Exhibition of Industrial Art at Leipzig in 1927 at which Carter Stabler and Adams exhibited. The dish is shape 910 (diameter 17 1/2 inches) pattern HD. Above - plate pattern EI by Ruth Pavely. Above - pattern EI adapted for a large vase. Above - unusual 'eye' design, shape 924 pattern KJ painted by Ruth Pavely 1934-1937. Left - pattern ZA shape 440 by Anne Hatchard. Right pattern FR shape 435 by Margaret Holder. Above -13" vase shape 949 pattern LG, painted by Anne Hatchard. This vase is sometimes known as 'the Holly Vase'. Above - Shape 946 (16") on white earthenware by Ruth Pavely, late 1930's. In 1931, Dorset portrait artist Arthur Bradbury showed some drawings of boats with a local and historic interest to John Adams. 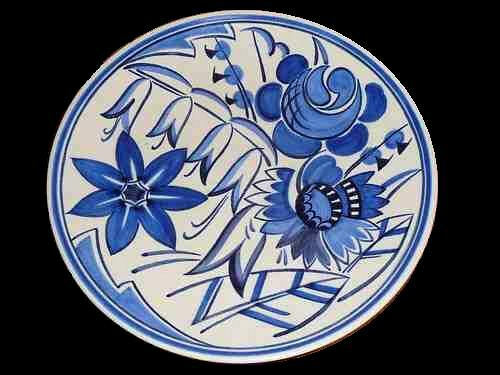 The drawings were accepted and there began a series of large dishes which were painted by the more senior paintresses. Arthur Bradbury had sailed as a merchant seaman on The Waterwitch, one of the ships depicted. Production of the ship plates continued after the War and versions were still in production until recently. Above - in 1939 Imperial Airways moved their flying boat service from Southampton to Poole to avoid air attacks by the Luftwaffe. The Poole Pottery showrooms were used as customs offices and Cyril Carter was employed by the immigration service. The outbreak of the Second World War brought the production of decorative wears to an end and there was no resumption in production for the domestic market until the lifting of Government restrictions in 1952. The 1950's heralded the beginning of a new era. Freeform shapes and contemporary patterns reflected trends in interior design and a nation's enthusiasm for the modern. 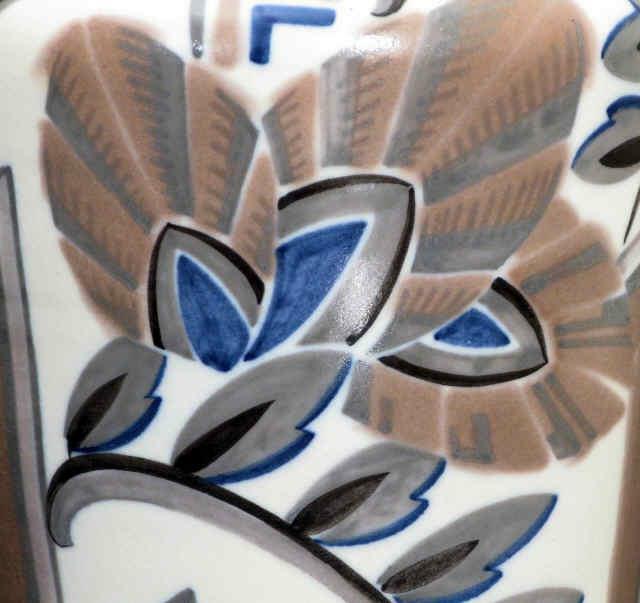 Poole Pottery retained its position at the forefront of decorative modernism producing designs which looked forwards rather than back, a philosophy which would in time lead to the formation of the Poole Studio. Above - the production of traditional wares did continue into the 1970's and beyond, albeit in a radically different form. The new glazes in use after the War gave pots a whiter almost clinical base colour and the plain background became more dominant as patterns became diluted, satisfying the need for cheaper production.